Up/Down Availability and Performance. At-a-Glance. See what's up and what's down instantly whether in the cloud or on-premises. Get complete visibility to the status of network devices, systems and applications. Leverage topology-aware monitoring that understands network dependencies so you receive fewer, more intelligent alerts. Receive notifications through SMS, email, web or Slack so you know about developing issues before users report them. See network devices, servers, virtual machines, cloud and wireless environments in context. Click on any device to get immediate access to a wealth of related network monitoring settings and reports. See how everything is connected and get answers faster. WhatsUp® Gold creates a detailed interactive map of your entire networked infrastructure. 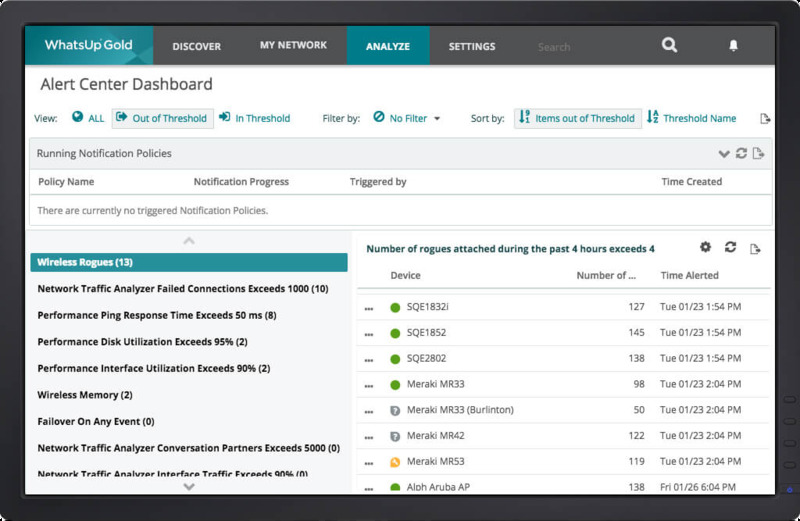 Leverage a dependency-aware network monitor to generate fewer more actionable alerts. Empower your network monitor with automated actions that trigger when a state change occurs including email alerts, SMS alerts, Slack alerts, IFTTT posts, service restarts, and web alarms. WhatsUp Gold's alert center and dashboards put you in control. Create dashboards for individual users or technology domains to provide the information you need to streamline troubleshooting or administration. Customize dashboards with reports for servers, applications, virtual, wireless, cloud and network traffic. Export or schedule report runs to share with your team or management. Monitor More of What Matters for Less. Real-time network monitoring deep-dive troubleshooting. Our Cloud Monitoring dashboards allow you to track cloud resource usage and billing and provide cost-justification to management. WhatsUp Gold automatically discovers, maps and monitors cloud environments including Amazon Web Services and Azure servers. Report and alert on the performance of every metric your cloud service provides through its API. As with all WhatsUp Gold data, this can be stored for years in order to track long-term trends - something impossible with the 60 or 90-day metrics most cloud providers support. Each plug-in module integrates seamlessly with WhatsUp Gold extending core discovery, alerting, reporting and dashboard capabilities. Dashboards and reports for visibility across all apps, individual apps or component level detail. Your VMware and Hyper-V resources shouldn't be a blind spot. The Virtual Monitoring plug-in accesses vCenter and Hyper-V Manager APIs to gather performance statistic and maps out the virtual environment. Get proactive alerts on performance stats and event logs. Discover management services (such as VMware vCenters) or individual hypervisors (Hyper-V, ESX/ESXi) running in an unmanaged environment. Get the monitoring and logging continuity required in high-availability, fault tolerant or workload managed environments. Scale network management to gain visibility to geographically remote networks. The distributed network monitoring feature extends the capabilities of WhatsUp Gold to multiple remote networks, allowing a central installation server and one or more remote installations. Monitor remote installations from a designated central network management server. Create remote site dashboard views. A number of remote installations can send data back to the central server creating a unified view for managing multiple remote networks. "The product has improved so much over the last couple of years it's hard to walk away from." "2017 plus really simplified the user interface." "Without it we were reliant on customers to call in and tell us they had a problem." Ipswitch tests and validates WhatsUp Gold multi-vendor network monitoring systems with leading technology platforms so you can be sure your deployment will be smooth. We stay platform-agnostic and provide in-depth server monitoring reports across diverse environments.